Industry – retail – consumer: a broken chain. Digitalization has been creating a new world with fundamental changes in economy and society. Appropriate new structures are still missing. Uncertainty is omnipresent. Industry and retail are desperately seeking to know as much as possible about the consumer. Excessive data mining tracks and analyses any movement of the consumer. Yet it is still hard to catch him. Industry and retail were used to rather homogeneous target groups. Now they are facing well-informed and fastidious consumers with fast changing preferences, looking for the right product at the right price. The relevance of consumer classifications is shrinking – time to get beyond stereotypes! One of the major reasons for the broken chain from industry to consumer is the fact that basic developments took each side in completely different directions. 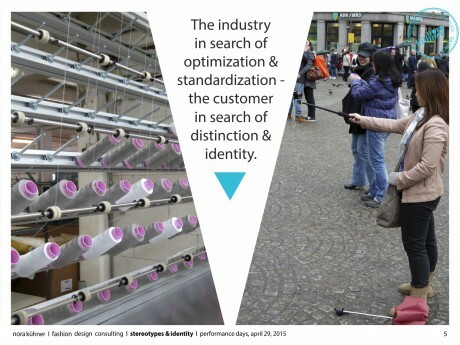 While the industry tried to standardize its products and to optimize manufacturing, the consumer has started his search for distinction and identity. Ever-growing numbers of social tribes, communities and target groups ask for products which fit their very special individualized needs. For many years the apparel industry both in fashion and sports is facing shrinking sales – clothing is no longer a highly desirable product. Most time of the year the consumer can buy clothing at reduced prices, shops are flooded with garments of increasing uniformity – a contradiction to the consumer´s wish for individualization. Collections are often only a rehash from the seasons before. A fundamental change in the structures and processes of the apparel industry is long overdue. Though the industry seems to be working ahead (in sports in general more than 18 months), there is only very slow adoption of new ideas and tools. It is high time to create values and prestige. The economic previews for the further development of the global sports apparel market are rather stable for the years to come. As sports activities have become part of the modern lifestyle, the demand will slightly increase. Yet we will have to push the boundaries of creativity, innovation and customer relation. 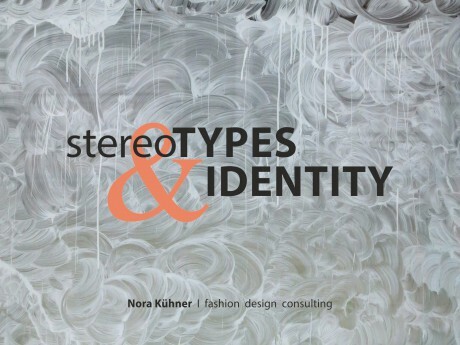 We have to take a close look to the identity of our consumers. 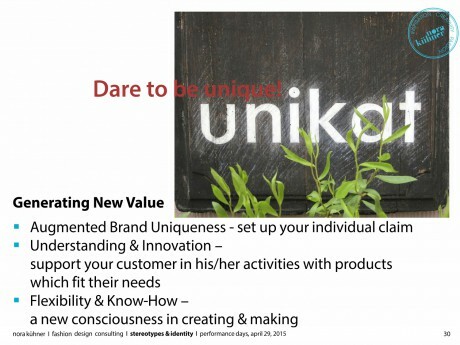 Innovation and carefully directed development derives from understanding the needs and desires of the consumer. A new consciousness in creating and making is required. Fashion brands which are working with performance fabrics and accessories demonstrate a relaxed way of bringing an active lifestyle on stage. 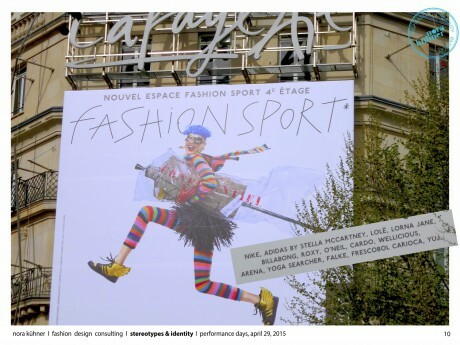 The fashionable or casual appeal of their collections attracts consumers who are not at all hard-core performers but want to integrate a sports feeling in their daily life. And these consumers are the majority. The sports apparel industry will lose these customers if the industry doesn´t develop an appropriate new vision of its future. Communication with the customer is another bullet point – advertising campaigns focusing on sweat and adrenaline may fit for the small group of high-performers, yet most consumers (at the forefront women) don´t feel attracted by this kind of advertising. 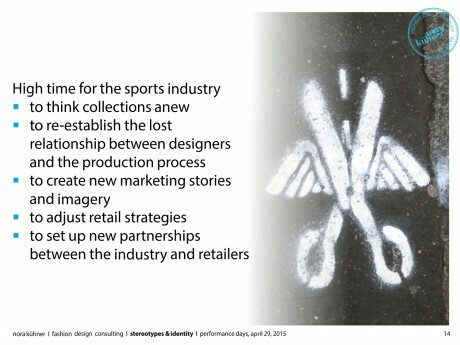 New marketing stories and imagery are needed for the future as the boundaries between fashion and sports will blur ever more. This transition creates new options – sports can be hard work, but most people just enjoy the movement and the feeling of doing something good for themselves. They just like to have a good time with clothing which is far more than just pragmatic. Yet it is not only the consumer´s identity which has to be discovered, it is evident that the single companies have to discover and shape their own identity (again). A sharp profile, clear claims and thoughtful developments will be essential for long-term success in the market.